We recognize that two years old can be an age of great development. Children may change and grow significantly in all ways during that period – cognitively, socially emotionally and physically. For this reason, needs and appropriate activities vary between younger and older two year-olds. With that in mind SNS offers two distinct two-year-old classes: a Tuesday and Thursday Yellowbird class for younger two year olds, and a Monday, Wednesday, and Friday Yellowbird for older two year olds. In both classes we keep the class size small (no more than eight children in the T/Th Yellowbird class and no more than ten in the M/W/F Yellowbird class) because we feel that working in smaller groups is important for children who are so young. This is their first experience with school – we want to make sure it is a successful one. Both classes are staffed each day with one teacher and two co-oping parents. For information on co-oping responsibilities for Yellowbird families, please see the Admissions and Our Approach sections. The goal of the Tuesday/Thursday Yellowbird program is to offer young children an opportunity to interact in a safe, secure and fun environment where they can begin the social process of making friends and being part of a group. 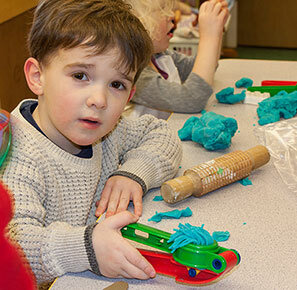 The classroom is center-based and the curriculum has art as its focus with accents on “messy” and “fun.” The children learn through their play with the guidance of a qualified teacher and parent co-opers. The goal of the Monday/Wednesday/Friday Yellowbird program is to offer young children an opportunity to interact in a safe and fun environment where they can begin the social process of making friends and being part of a group. The classroom is center-based and the curriculum has art as its focus, taking into account the students’ interest and events which occur naturally within the classroom and their homes. Through process art projects there is emphasis on exploration and creativity, rather than the end result. Our activities can be “messy”! 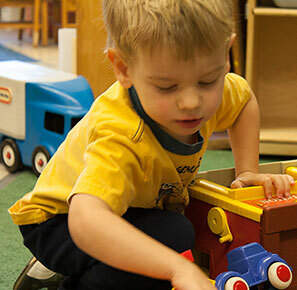 With the guidance of the teacher and co-oping parents, children learn through their play, while developing their verbal communication and social skills. 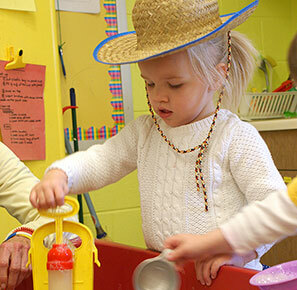 Regular classroom activities in both Yellowbird classes include: music and finger-plays, art projects, building, imaginative play, science and nature exploration, literature, and outdoor exploration and play.